Super Hero Boy: What's in your attic? Connor likes to tell me that there is monkeys in our attic, but after watching this movie he may just reconsider. 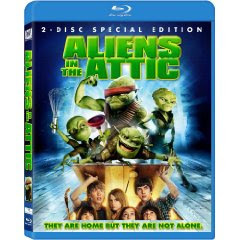 Aliens in the Attic is a fun addition to your movie collection for the holiday break! Kinda goofy, very kid oriented, but lots of fun. The whole idea behind the movie is a family goes on vacation to a lake house, a story we know so well in this family at least. Once they get there they find out that there are some very unexpected guests hanging out in the attic. A group of kinda silly, short, dense little aliens have invaded the attic and take over the brains of the people they conquer reducing them to walking remote controlled people. The whole skit with the grandmother being used as a remote control is absolutely hilarious! We saw the movie on bluray and let me tell you for a movie that is really marketed more towards kids than adults the video quality is really awesome. The details on the aliens are really impressive and though I'm usually not a huge fan of mixing animation and live action it comes off really clean and totally distracting. There are some huge kids stars in the movie and the whole thing is really done quite well. Though this movie got pretty bad ratings in the theaters I'm really not sure why if its not only for the fact that it really is more of a kids movie than a family/adult movie for the sheer goofyness factor. However if you have younger kids in the house or even older kids who are of the whole "High School Musical fanclub" they will absolutely love it. Nothing about it is scary, and everything in it is totally kid safe for even the youngest viewers. The bluray title offers quite a few extras to enjoy including a gag reel which will leave you laughing and a video game that is absolutely hilarious. That grandma I was talking about returns in her own little mini video game included on the disc. You can also check out the alternate endings. All of which are included in the standard edition as well. It's certainly a great addition to the stocking stuffer collection for the holidays or a good pick to keep the kids entertained while the adults spend some quality time over the holidays. Connor certainly approves. You can pick up your own copy of Aliens in the Attic right now on Amazon! I have two copies of Aliens in the Attic to give away to my readers! Leave a comment on this post. Just check out Aliens in the Attic and tell us who one of the stars in the movie is as well as who's your favorite. I love Doris Roberts. She's great! I LOVE Doris Roberts. Her Character "NANA" is my fave. Tim Meadows is really funny. I loved Dora Roberts in it. She was so funny as the grandma doing the ninja style moves. I've been a fan of Thomas Haden Church since he was so hilarious on Wings. You are on my sidebar. I love Thomas Hayden Church! My daughter loves Ashley Tisdale. I love Ashley Tisdale from Disney Channel and her charity work on Extreme Make-Over Home Edition. I love Doris Roberts. She's my favorite. Doris Roberts. I have loved watching her act sense she was on a hit show called Angie. Kevin Nealon, he's also my favorite! I've always liked Kevin Nealon. Ashley Tisdale is in the movie and she is my daughter's favorite! Kevin Nealon is my favorite - I like him also in "Weeds"
I like Kevin Nealon. Thanks for the chance. Tim Meadows is always funny. Doris Roberts is one of my favorites & she stars in the movie. Tim Meadows is in this. He's one of my favorites because he's great at comedy, but he can also do a lot of other roles. Thanks. doris roberts known as Nana! I personally like Kevin Nealon. He is really funny. Ashley Tisdale is in it and her character Bethany sounds like fun! Kevin Nealon. I used to enjoy watching him on Saturday Night Live. I wondered whatever became of him. Thank you for the chance to win. My favorite is SNL's Tim Meadows (The Ladies Man). Please accept my entry. Thank you. Doris Roberts - from her days on Everybody loves Raymond. I will say there are a lot of good actors/actresses in this movies. Austin Robert Butler stars in this movie. My favorite person in the movie is Kevin Nealon. Funny guy! Kevin Nealon is in the movie, but my favorite is Doris Roberts, thanks! Doris Roberts (love her) as Nana is my favorite. Doris Roberts is always a hoot! I LOVE Doris Roberts. Her Character "NANA" is my absolute favorite. Tim Meadows is in it, I also like Doris Roberts! Kevin Nealon. Loved him on SNL! Doris Roberts (my favorite) and Kevin Nealon are in this movie. Doris Roberts is my favorite actor in this. I also like Kevin Nealon. Doris Roberts is in the movie. I do not have a favorite character as I haven't seen the movie yet. I don't really have a favorite. My kids have been wanting to see this. I love Doris Roberts. Her character is my favorite! There are a lot of good actors in this film: Kevin Nealon, Tim Meadows, Doris Roberts. My favorite character has to be Nana Rose, played by Doris Roberts. I watched a clip about the filming of her fight scene and it was very entertaining. I subscribe to your mailing list via email. Don't count this as an entry. I did another tweet because I made a mistake on the first one. I left both of the tweets up though.